The Garmin III+ was the grandest thing that ever happened to Zero Six Hotel--but oh! the trouble I had using it. I'd stick it in my breast pocket, or in the map pocket behind the front seat, and I always had to fumble before I could use it. Then I read about this idea: mount it on an inverted plastic picture frame, and put the frame in the map pocket. Well, that didn't work because the base of the frame interfered with the stick. Then I realized that I could simply invert the picture frame over the front seat, as shown here. Mark Lund sent me this photo of his GPS mounted with one of those handyman clamps from the local hardware store. It appears to be fastened to a bit of aluminum? angle, and that in turn Velcro'd to the GPS. 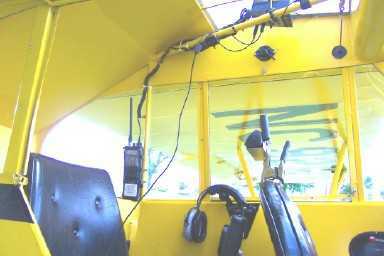 Also note his handheld receiver, mounted to the windowframe, and the intercom perched on the port overhead tube. The wire coming down to the seat is the push-to-talk switch. 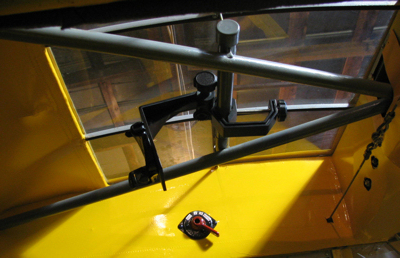 Here's a handsome "panel" for the back-seat Cub driver. Here's how Jack did it: "Remove the leather seat cover [and] canvas seatback. Cut a piece of 1/8th in marine plywood to fit in the space formed by the seat back tubing. Center fore and aft. Attach with four adel clamps. 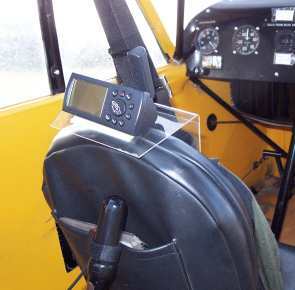 Attach your Garmin GPS and com radio to the plywood using Ram round-a-mount item B-149z-G1K for the GPS and B-138-BC1-K for your com radio. Mount them low enough so the tops of both are below the top of the stick. With full forward stick your knuckles and the stick will not be interfered with. "Remove the GPS and Radio at the lower ball. Re-install the canvas seat cushion and the leather seatback. Cut holes just big enough to allow the ball of each mount to protrude through the leather seatback. The postion of the mount balls are located inside the pouch of the seatback. Re-attach the GPS and Radio at the balls. All Headset and ant. cables can be routed inside the seatback pouch and out the bottom. Very clean. The GPS is low enough to be better hidden from the sunlight for better clarity. 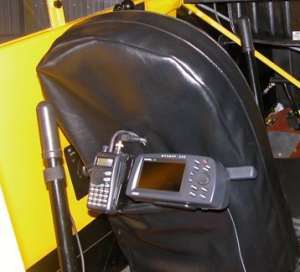 When the GPS and Radio are removed the mounts are not visible without digging in the seatback pocket." Paul Robbins just adapted the bracket supplied by Garmin. "The GPS 296 mount is attached to a PVC pipe secured to the overhead framing and it easy to see and accessible and the satellite reception is good as there are no overhead obstructions." The pipe has slits in each end to fit over the thin vertical rods, with an end cap overall, so it can easily be removed.